When general store owner Melchor Villanueva leans on his countertop he can see his whole world under his hands. The counter’s glass surface displays photos of his community: young soccer players, teens in their coming-of-age quince años finest, and bandanna-wearing fishermen. Many descend from survivors of Hurricane Janet, which in 1955 killed a third of the population of Xcalak, a beach town on the Mexico-Belize border, and destroyed the town’s coconut plantations. “It left only sand,” Villanueva recalls. Villanueva had arrived in Xcalak just two months before the hurricane to pick coconuts. Afterwards, he and many fellow survivors turned to the sea for sustenance and commerce. Meanwhile to the north, Mexico’s federal government encouraged the development of Cancún and a new kind of commerce: mass tourism. Over the next few decades, the people of Xcalak watched as huge hotels around Cancún replaced mangrove forests and let their untreated waste flow onto coral reefs. Larger fishing operations moved in to meet tourist demand. Xcalakeños began to fear runaway development more than hurricanes. To manage the impact of these industries, in the late 1990s, the community, including Villanueva, asked for – and received – national park status.1 1. Hoffman, D., 2009. Institutional legitimacy and co-management of a marine protected area: implementation lessons from the case of Xcalak Reefs National Park, Mexico. Human Organization, 68 (1): 39-54. DOI: http://dx.doi.org/10.17730/humo.68.1.28gw1106u131143h See all references Today, local fishermen, tourism workers and even national park officials in Xcalak each tell their own version of what happened next, but they converge on this: just declaring a place a park is not enough to create a resilient community. Generating new sources of income while protecting the underlying natural resources has required the community to experiment, err, revise its plans, and repeat. 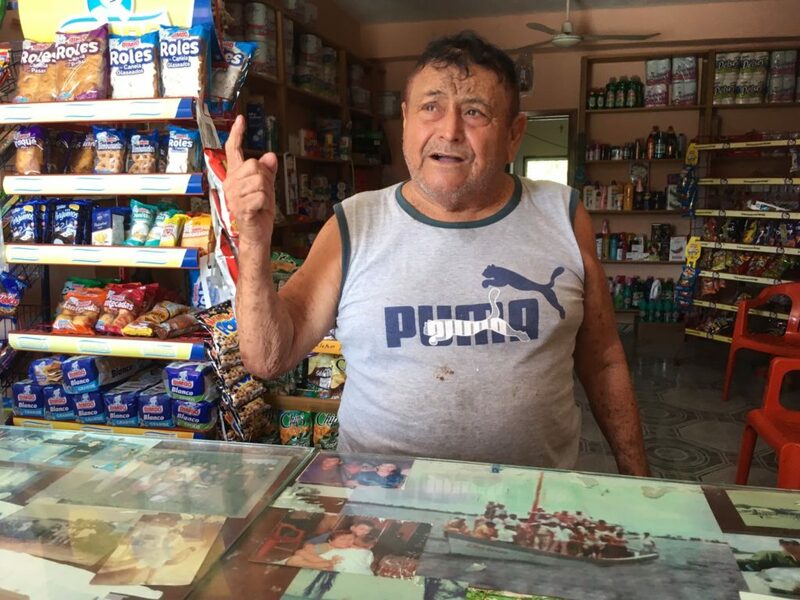 Melchor Villaneuva behind the counter of his general store in Xcalak. Copyright: Gabriela Lendo. 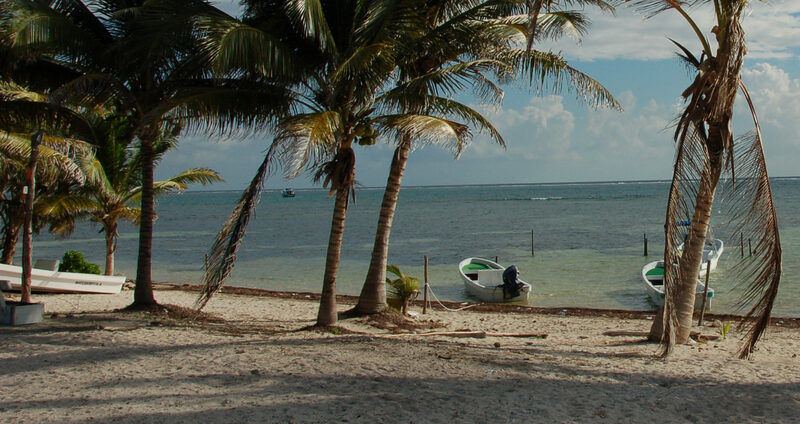 Xcalak is at the end of the road south from Cancún on Mexico’s Caribbean coast. Travelling any farther south, towards Belize, requires a motorboat and a smuggler’s head for navigating the mangrove thicket that spans the border. Half a dozen small resorts dot the beach north of the town. Palm trees sway on the skyline. Waves breaking over the reef just offshore fill the air with a throbbing hum. Iguanas bask in the sun among trash in people’s gardens. Plastic bags cruise the reef like zombie jellyfish. Xcalak lacks municipal water purification, an electricity grid, and a sewage network. It is a paradise with problems. The history of development in Xcalak is short. Even people who lived here before Hurricane Janet had not been here long: most arrived after the installation of a Mexican Navy border post in 1900.2 2. Daltabuit Godás, M., Cisneros Reyes, H., Valenzuela Valdivieso, E., 2006. Globalización y turismo en el sur de Quintana Roo. Estud. Cult. Maya. 27:99-124. ISSN 0185-2574. Abstract in English See all references When Villanueva arrived, the town was full of Spanish colonial-style houses built by coconut profits. But with plantations flattened after Hurricane Janet many workers emigrated and coconut buyers stopped visiting. Like many who stayed, Villanueva bought a small sailboat and began fishing. Fishermen would motor over to Banco Chinchorro, a coral atoll offshore, to gather queen conch, large sea snails with valuable meat and shells. In the 1950s Villanueva heard from someone in Cozumel that black coral was worth a lot, so he began diving for it, tying it to a rope to be hauled up by his companions. The community seemed to have found economic replacements for its coconut crop. Local fishing co-operatives also benefited from federal quotas for certain valuable harvests. But in the 1960s and 1970s foreign and tourist demand grew for fish, queen conch, and especially Caribbean spiny lobster. At least one isolated example offered Xcalak fishermen a positive model of a protected area with well-managed co-operatives. The Vigía Chico co-operative, some 100 km to the north of Xcalak, developed a technique akin to ranching for lobsters in the 1980s. It allocated exclusive rights to underwater areas to individual members, who then built small concrete structures to attract and house free-ranging lobsters. The co-op enforced rules for minimum harvest size and respect for individuals’ harvesting rights, and Mexican courts backed its authority when challenged by fishermen excluded from the co-op for violations.5 5. Cunningham, E., 2013. Catch Shares in Action: Mexican Vigía Chico Cooperative Spiny Lobster Territorial Use Rights for Fishing Program. Environmental Defense Fund. 10 pp. PDF See all references The co-op members’ yields were the highest in Quintana Roo. Óscar Salazar lives in a blue house perched on stilts, above the reach of flooding, at the entrance to Xcalak just before the paved road ends. The son of a fisherman, Salazar keeps a lobster trap around the back on the patio he shares with a neighbour, propped alongside a child’s plastic push-bike. Salazar grew up fishing, but he has learned not to rely on it: “Fishing is just one activity and it’s risky,” he says. He now divides his time between fishing and tourism, and says his son’s generation must find a place in an economy more dependent on tourism. To help pave the way, in the 1990s Salazar took part in the initial community committee that brought the national park system to Xcalak. Fisherman and tourist guide Óscar Salazar at the entrance to Xcalak. Copyright: Gabriela Lendo. At the time, the Quintana Roo state government was planning Cancún-like development in the southeast, recalls Juan Bezaury, now The Nature Conservancy’s country representative in Mexico. Bezaury was working for the conservation charity Amigos de Sian Ka’an (ASK). State officials were paving the road from Mahahual to Xcalak and talking about opening a ferry route from Chetumal. The threats and promises of development loomed. Then state infrastructure development stalled. The neglect left time for Xcalakeños and their outside advisors to generate their own management plan. ASK won United States Agency for International Development (USAID) funding and brought in experts to advise Xcalakeños on how to make their future sustainable. “The traditional fishermen in Xcalak didn’t like what they saw” in neighbouring communities with lots of tourism, Bezaury says. The scale of infrastructure, the attendant pollution, and outside investment dwarfed their community’s ability to protect their way of life. Quintana Roo, for example, accounts for around half of Mexico’s entire tourism industry. With help from Bezaury and others, the community prepared and submitted a proposal for a new national park that would attract tourism development more compatible with their existing way of life. Xcalak is at the end of the road south toward Belize from Cancún, and just south of Mahahual, a small town with a large cruise ship dock. Illustration: Elsa Wikander/Azote. To promote marine tourism, members of the fishing co-op agreed to avoid fishing in prime diving spots on the coral reef, such as a wall called “La Chimenea” that includes a large underwater cavern. They also agreed to restrict themselves to line fishing in areas reserved for catch-and-release fly fishers, who had begun visiting from the US and Canada in search of tarpon, bonefish, and other fish. Their sacrifices have had success: a recent study by the Healthy Reef Initiative reported a recovery of groupers and their prey, parrotfish, which help protect coral reefs from algae, in Xcalak protected waters.6 6. Kramer, P., McField, M., Álvarez Filip, L., Drysdale, I., Rueda Flores, M., Giró, A., Pott, R., 2015. 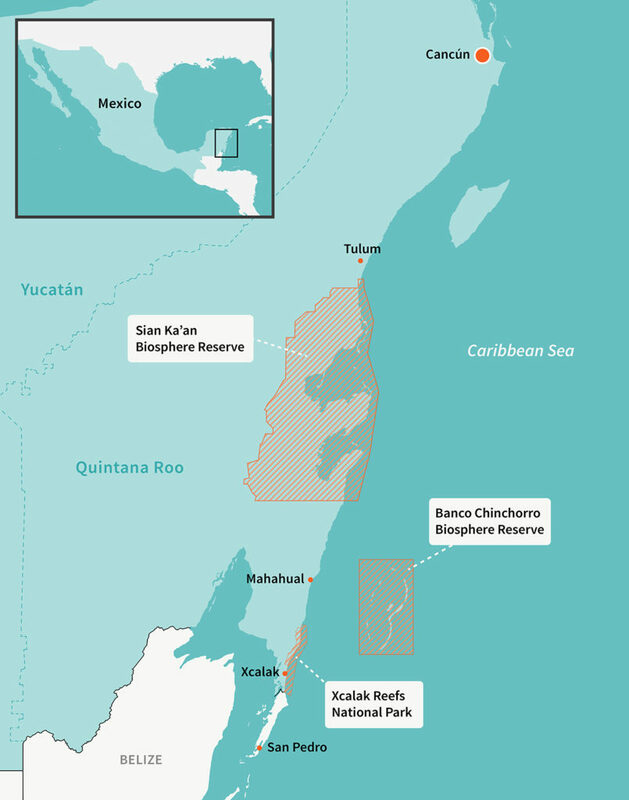 2015 Report Card for the Mesoamerican Reef. Healthy Reefs Initiative (www.healthyreefs.org). 31 pp. PDF See all references Snorkellers and divers can also see freshly installed elkhorn coral buds throughout the park. Fishermen such as Salazar realised that their careers would have to be hybrid. Salazar still uses his lobster trap occasionally, but he also heads Xcalak’s tourism co-operative. Anticipating the need for new skills, he and others wrote into the management plan the need for training Xcalakeños in tourist-friendly skills. From 2004 to 2014, under the management plan, the park spent about 5 million Mexican pesos (worth about USD 385,000 at the time) on job training such as scuba diving, English, hospitality, crafts, and first aid for Xcalakeños. “They’ve had a lot of training,” says María del Carmen García, director of the Xcalak national park over that decade. The management plan also reserved thirty of its forty commercial boat permits for the tourist co-op run by Salazar, which requires members to have lived in Xcalak for five years. Yet visitors to Xcalak today will find only a handful of tourism enterprises. 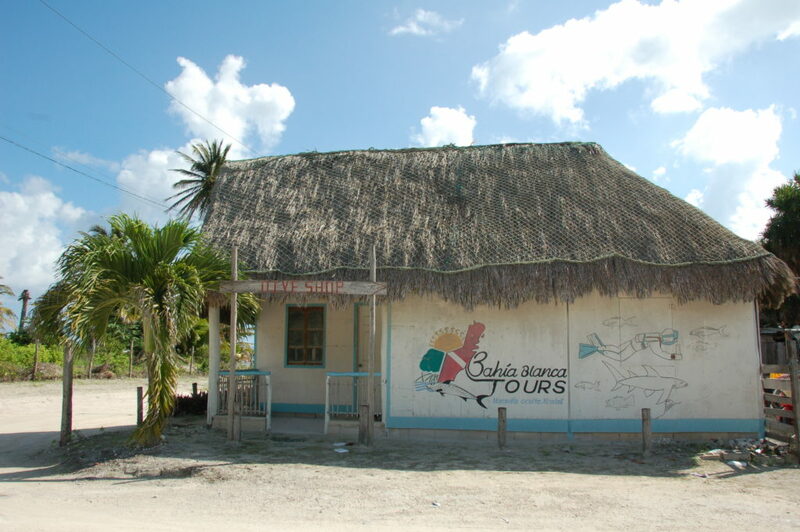 Some hand-painted signs on homes advertise local fly-fishing guides and snorkel tours. But knock on the door of the tourist co-op and no one answers. The dive centre that occupies what is perhaps the biggest building in Xcalak is outsider owned and operated. All but one of the resorts farther up the coast are foreign owned. The dive centre and other foreigners control most of the ten independent boat permits and locals use only three of the thirty co-op boat permits. The Bahia Blanca tourism co-operative building in Xcalak. Copyright: Lucas Laursen. “It’s not the same thing to fish as to handle a tourist,” Salazar says. Some local boat owners, accustomed to fishing when and how they wish, are unwilling to march to the drumbeat of the tourist industry, he says. Even something as simple as filing the paperwork to request a co-op boat permit is too much. 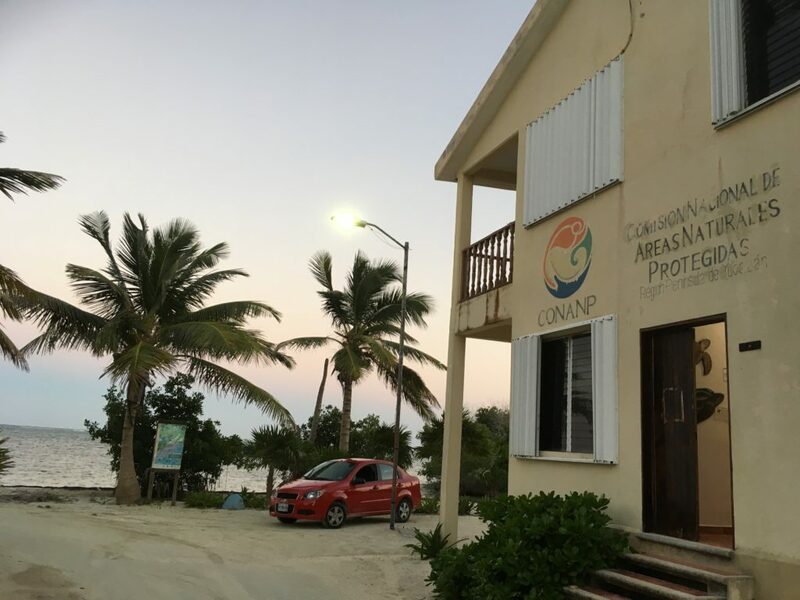 Leonardo López, the tourism specialist at the National Commission of Natural Protected Areas (CONANP) office in Xcalak, says the problem also has to do with personal disagreements with the tourism co-op. “People want in, but not to work with the co-op,” he says. Instead, some community members blame him for letting the foreigners, who pay accountants and administrators to handle paperwork, win the independent permits. Anthropologist David Hoffman of Mississippi State University did his dissertation research in Xcalak soon after the founding of the park. He attributes such negative reactions to a mixture of culture shock and economic self-interest. “It was a transition from an extractive economy … to a managed presence, of an outside authority telling people what to do, that clearly benefited only a certain number of individuals in the community,” he says. Some resentment was inevitable. It is also dangerous. Resentment can motivate locals to poach marine and terrestrial wildlife and undermine the park’s aims. García says that the biggest challenge in her tenure was illegal fishing. National park officials have no arrest authority and local municipal officials hesitated to arrest their neighbours and family. García had to persuade the national fishery commission to visit and make occasional arrests, confiscate equipment, and fine poachers. The fishing co-op, which pre-dates the park by decades, has persuasive power, but little enforcement power. While the Healthy Reef Initiative study showed some fish populations had recovered, the co-op decided that queen conch populations were precarious enough to enact a five-year collecting ban. Yet one hotel manager offered recent visitors to Xcalak some of his family’s “personal supply”, and many empty conches along the reef hint at recent harvesting. Villanueva is sceptical of the park authority’s ability to control illegal fishing. Enforcing the rules would “hurt a lot of people”, he says, by limiting their livelihoods. Salazar points to the park’s work to promote other means of earning a living, from handicraft courses for women to beekeeping courses for retired fishermen. The CONANP building advertises decorations made from local seashells by a women’s co-operative. “They support us,” says Lety Flores, a part-time craftswoman. She and her cousin Susy Puc sit in the mosquito-infested twilight, making jewellery on Flores’s back patio, something they do most evenings for about three months a year. Puc says that she and other Xcalakeños welcome alternatives to fishing, like the handicrafts, but that in the meantime, fishermen “have to feed their families”. Despite the additional complexity of a tourism economy, Salazar says he sees advantages in its diversity for his son’s generation. In addition to the community-organised tourism co-operative, for example, the national park is training a youth group to track wildlife in the park. “The next generation has a better understanding of the word ‘conservation’,” Salazar says. Like it or not, they will have to contend with outside ideas of conservation. In late 2016 the Mexican government announced that the entire Caribbean coast outside of existing protected areas is now a biosphere reserve. Whether such top-down government structures as the reserve and national park are flexible enough to attract local support remains to be seen. The 1997 Xcalak national park management proposal calls for revisions every five years “as the social and economic situation in the area is constantly changing”. Yet Villanueva, who keeps the management plan at hand in his shop, complains that officials have not updated it since 2004.7 7. Lopez, C.S., McCann, J., Islas, C.M., Rubinoff, P., 1998. Community Strategy for the Management of Xcalak, Quintana Roo, Mexico. English Summary. Amigos de Sian Ka’an, Quintana Roo, Mexico. 9 pp. [PDF of original Spanish text: https://simec.conanp.gob.mx/pdf_pcym/37_DOF.pdf] PDF of English Summary See all references “They put me aside and instead of doing what we had agreed on, they did what they wanted,” Villanueva says of federal officials. This text is in the Creative Commons. Images are copyright is indicated in the captions.